As of October 1, 2018, consumer reporting agencies (CRA) in Maryland must comply with several new registration requirements. They will also need to comply with a number of new rules regarding their operations. These changes were introduced by Maryland House Bill 848 which was signed in May. Under the new registration requirements, CRAs will need to post a surety bond in an amount of up to $1 million and will need to register with the Office of the Commissioner of Financial Regulation (OCFR). Keep reading for a full overview of the bill’s provisions and how these will affect Maryland CRAs. House Bill 848 makes several amendments to the articles “Commercial Law” and “Financial Institutions” of the Annotated Code of Maryland. With regards to the registration changes for CRAs, HB 848 mandates that agencies now need to register yearly with the Office of Commissioner of Financial Regulation. Moreover, agencies may further be required by the Commissioner to obtain a license through the Nationwide Mortgage Licensing System and Registry (NMLS). A further important change to the registration requirements is the introduction of a surety bond. Unless exempt by the Commissioner, CRAs will now need to post a surety bond in an amount determined by the OCFR but no more than $1 million. See the section below for more information regarding the bond requirement. Though the bill became effective on October 1, these requirements become effective for registrations and renewals on June 1, 2019. Several other requirements are introduced as well. CRAs will now need to provide a secure, electronic method for placing, lifting, and removing security freezes. The bill also expands the definition of a “protected consumer” to include the elderly, certain members of the military, and others. HB 848 also increased the amounts for civil penalties that may be levied against CRAs. First violations may now be penalized with as much as $1,000, and subsequent violations with as much as $2,500. CRAs that are being investigated may also be required to pay any fees that the OCFR determines are needed to recover the costs of an investigation. What’s the Purpose of the CRA Surety Bond? 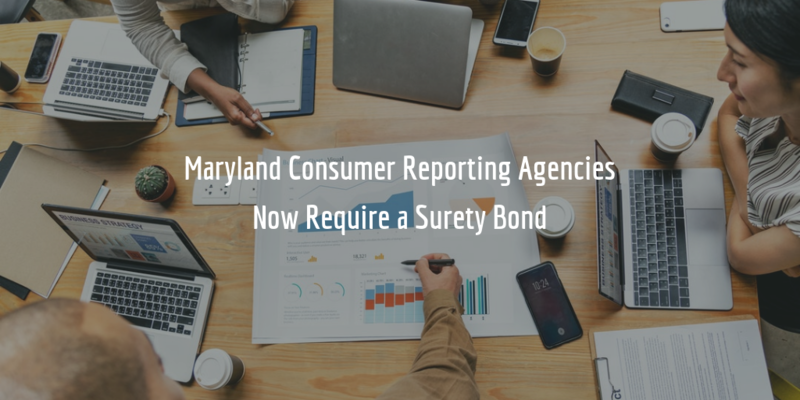 The bill specifies that the bond is intended to be for the benefit of the state of Maryland as well as any consumer who is injured due to a violation of the law on behalf of a CRA. The bond is also for the benefit of any consumer who suffers actual damages due to a breach of the security of a system experienced by a CRA. In any one of these cases, a claim can be filed against the CRA’s bond for compensation. The surety must then assess the claim and may extend compensation to claimants for as much as the full amount of the bond. Under the bond agreement, the CRA must then repay the surety in full. The bill also requires the surety to be liable for three years after the bond has been canceled or a CRA has ceased to be registered. What’s the Cost of the Bond? Your bond cost is a fraction of the full bond amount. It is determined by the surety on the basis of your personal credit score as well as other factors such as your financial statements. The higher your credit score is, the lower your premium will be. The exact cost of your bond will depend on the amount of your bond determined by the OCFR. Once you know the required bond amount, try our surety bond calculator below to get an estimate of the cost of your bond. Want to know more about this bond and the bonding requirements for CRAs in Maryland? Call us at 877.514.5146 anytime!